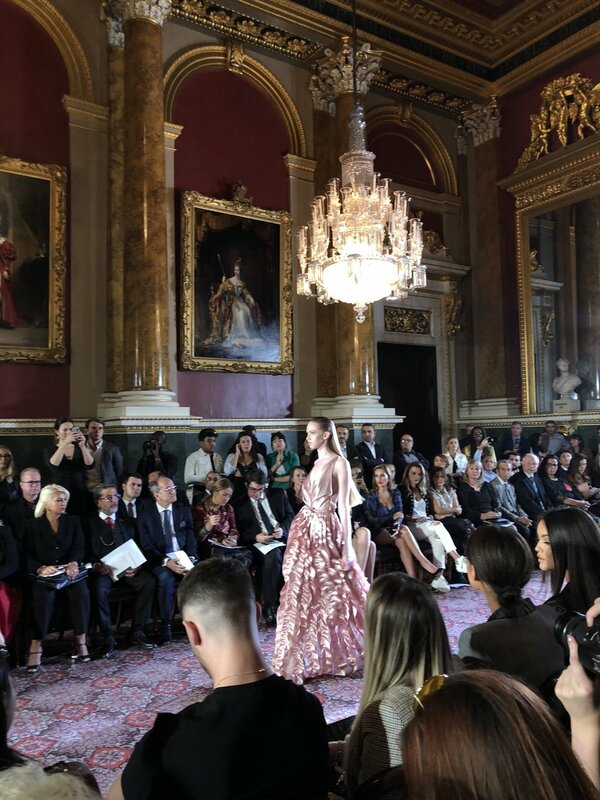 Friday the 14th of September kicked off London Fashion Week Spring Summer ‘19. That evening was the first presentation I helped with which was by the amazing shoe brand Kalda. Instead of a traditional catwalk, this show was set up in a room with 70s style furnishings. 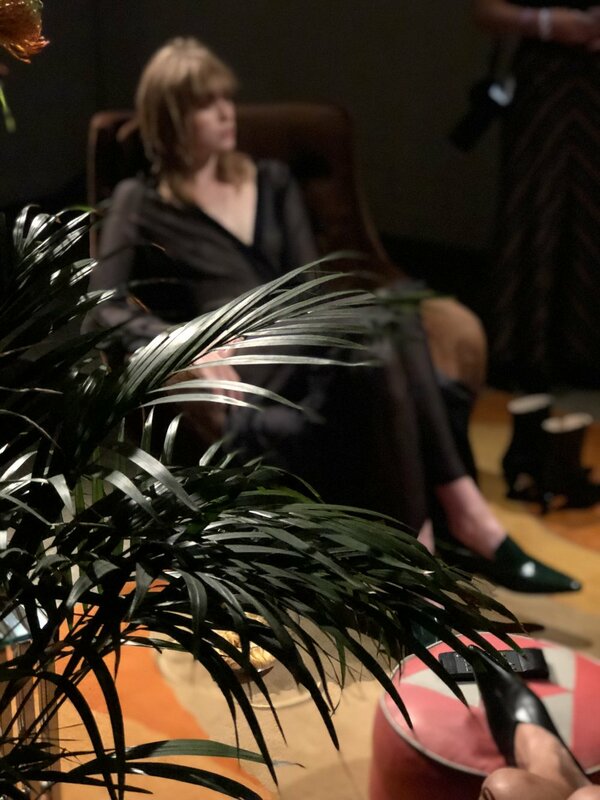 Models were dotted around the room splayed across various chairs and couches sipping martinis as if they were at a cool apartment party in the 70s. The guests could wander through to observe the gorgeous new shoe collection gracing each models’ feet. You really felt immersed as if you were a guest at the party too! I’m obsessed with the Kalda collection so go check them out! Saturday was a fun filled day! 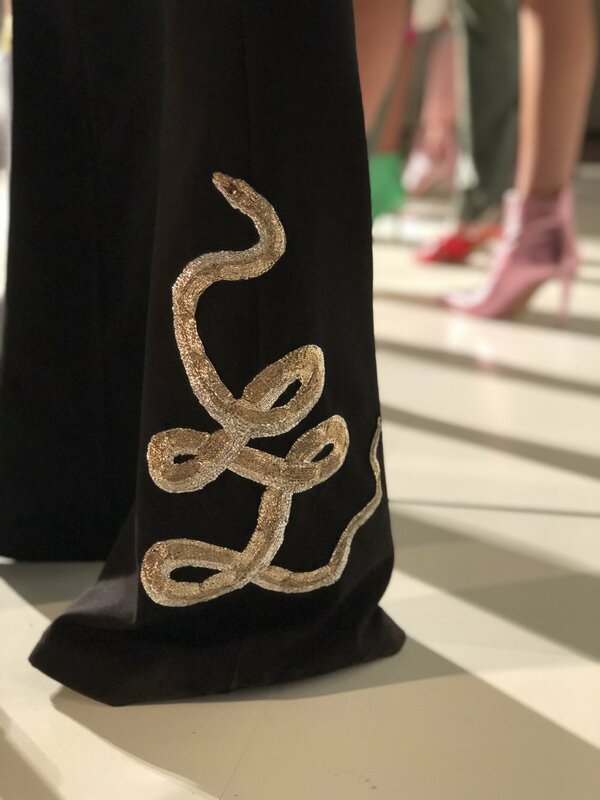 In the morning we had another presentation to help out with by designer Clio Peppiatt who makes the most gorgeous, beaded and embroidered designs. The set was designed to look like a nail salon and the models existed within it. I love Clio’s designs and how intricate they are! The hair and makeup were also amazing. 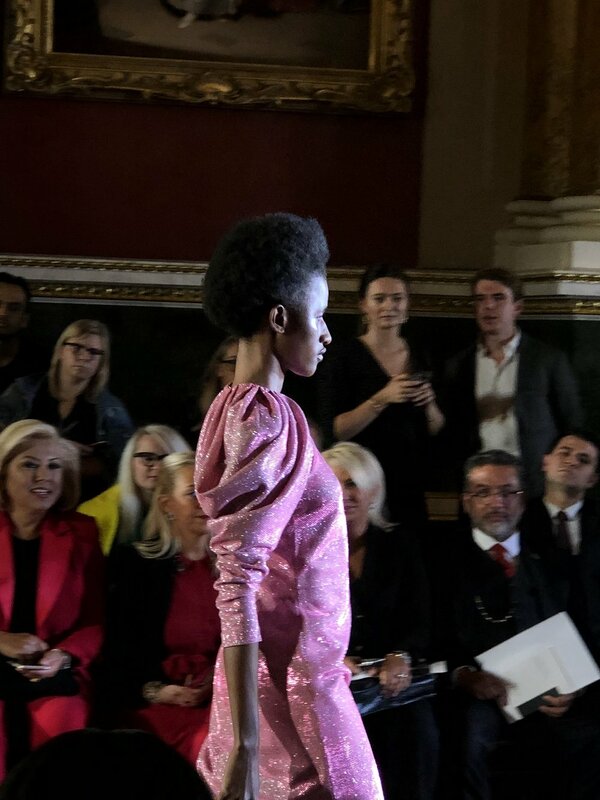 Later that Saturday evening was the Zeynep Kartal catwalk show in a grand old hotel, the Goldsmith’s Hotel, near St. Paul’s Cathedral. The hotel was covered head-to-toe in old aristocratic paintings, gold inlay molding and giant, extravagant chandeliers. 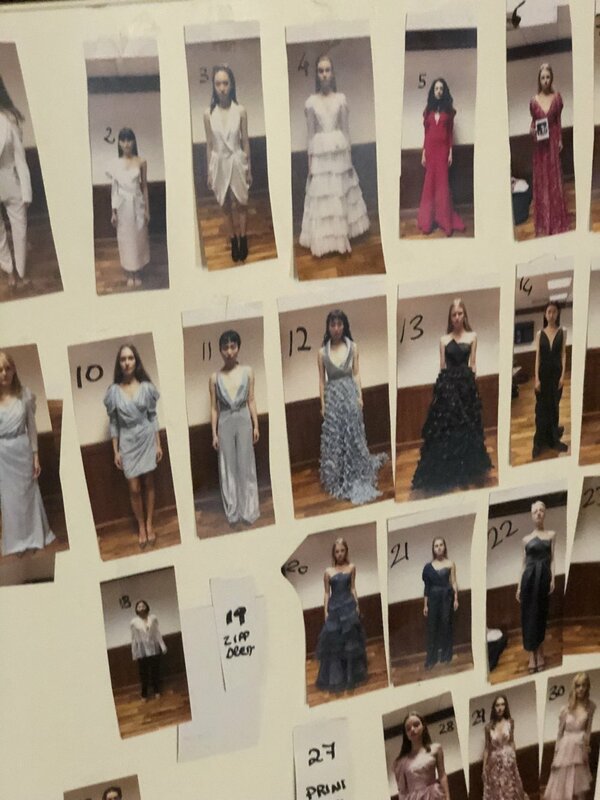 We, as interns, got to see all of the behind the scenes craziness including hair, make-up, dressing, first walk through, and lighting set up for the show, which was such a special experience! We helped buy food for the models, steaming some of the clothing, set up the VIP seating, and helped to reserve the VIP seating. I loved the energy and creativity of all the people around before the show rushing around all over the place. It was chaotic but also beautiful. There were VIP guests from Great British Bake Off, like Candice, Love Island, and other British reality tv stars which was super interesting to get to see! We then got to watch the show and it was honestly so magical with the grand venue and romantic dresses. I felt honored that I got to stay and enjoy the show as well as help behind the scenes. I couldn’t get enough. I could have experienced that day over and over. Sunday I didn’t have to work, so my friend, Ros, and I decided to just go and enjoy some Fashion Scout fashion shows! We started with a show at 12:30pm which exhibited three different young designers as ‘Ones to Watch’. They were Price on Request, Aucarre, and Nous Etudions. These three were all quite edgy and avant garde. The second show was a single designer, Farzaneh H. Christensen, which featured lots of gorgeous romantic designs with golds, blues, and turquoises. The final show, A-Jane, we also dragged my brother to, which I think he secretly enjoyed haha. It was another single designer with very cool, origami-inspired designs, as Fergus pointed out. 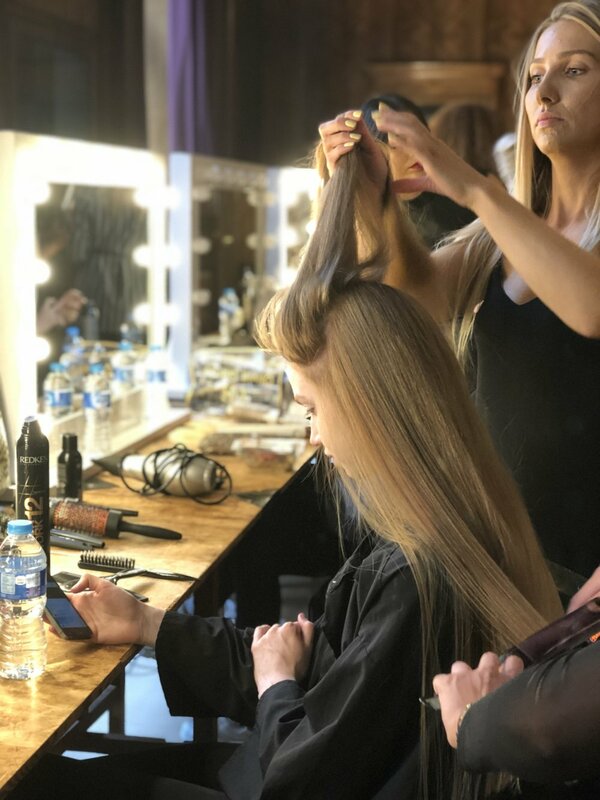 I hope you enjoyed reading all about my amazing experience at London Fashion Week! Comment down below if I missed anything or if there’s any questions you have. I’d honestly love to answer them all day long. I could talk about all of this for ages haha. I honestly feel so lucky to have experienced this. As always, thank you for reading my blog post! It means the world to me. Check back next week for another post. Have a great week friends!